I added three fields to the structure. The loader will add LoadLibraryA and GetProcAddress function addresses from kernel32.dll to first two fields. Last field points to the end of import address table, and we will write null to it, to let the loader know that we don't need any more functions. I will tell you more about this later. Now we need to create a new import table. My PE library will be very handy for this. (We will forget about old original import table for now). 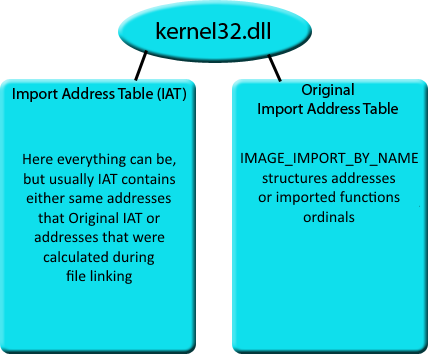 Loader writes imported function addresses to Import Address Table (IAT) for each imported dll, and it takes imports or imported function ordinals from Original Import Address Table (or, in other words, Import Lookup Table). We can manage without last one, for example, all Borland compilers always operate that way, they don't care about Import Lookup Table. In this case our only Import Address Table initially contains imported function ordinals or names, and there, over these data, the loader writes imported function addresses. We will not create Original Import Address Table too, we will manage without it (import tables will take less space), so let's turn off this option in imports rebuilder. 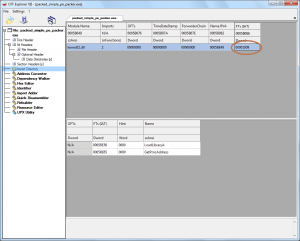 The settings.save_iat_and_original_iat_rvas call sets up the rebuilder in such way, that it will not create its own IAT and Original IAT, but write everything by the addresses, which are specified in each library (do you remember kernel32.set_rva_to_iat call?). As you can see, the addresses we need have been written to 0x1009 and 0x100D, this means everything was done correctly. (Entry point address is absolutely random yet, and there isn't any unpacker, so the file still will not run, but we achieved a lot already). //Our structures header file #include "structs.h"
//Header file with unpacker parameters #include "../unpacker/parameters.h"
unpacker_main procedure. Notice that this function is declared as naked. This tells the compiler not to create prologue and epilogue (stack frame) for this function automatically. We need to do this manually, and why - I will explain this at the next step. Now we create the same prologue and epilogue as created by MSVC++ compiler. "sub esp, 128" line allocates 128 bytes on stack - this will be enough for our needs. The packer will not do anything serious at this step. We need prologue and epilogue to let us allocate memory on stack without additional issues. At the end we write ret instruction - return to kernel. Now we will write most simple packer body. 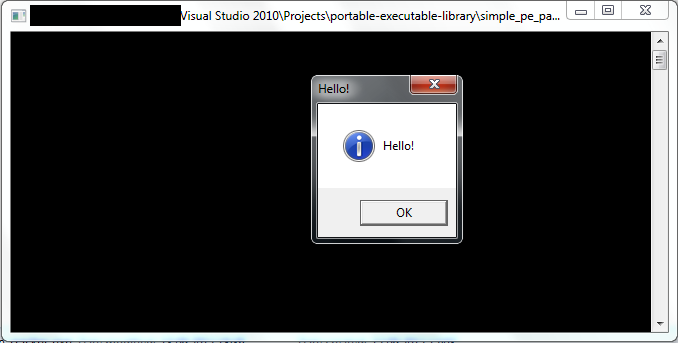 Let it just welcome us by displaying a Message Box with "Hello!" message. Here we declared two local variables. First one contains actual image loading address, and the second one - relative first section address, in which, as you remember, we store all required unpacker information and packed data themselves. Using packer, we will save real values instead of 0x11111111 and 0x22222222. It looks like everything is clear here. At the beginning of first packed file section there is packed_file_info structure, which is created by packer. It has three additional fields, which are filled by the loader itself - we set up import table in that way, as you remember. We get LoadLibraryA and GetProcAddress function addresses from these fields. You can also ask, why I declare all variables first, and assign their values later, although I could make this with one line. The thing is, that it is not possible to declare a variable and assign its value right away in naked functions. This also should be clear in general, except weird string filling. We allocated buf buffer on stack. All our strings also should be allocated on stack - we can not write anything to data section, because it will inevitably bring to relocations occurrence, and the code will become base dependent. This is why we so absurdly write strings directly to stack buffer by 4 bytes. We also need to keep in mind backward bytes order, which is used in x86 architecture, and we write code for it, so letters in 4 byte string pieces are arranged backwards. At first we load user32.dll library, then we get MessageBoxA procedure address from it, and then we call it. That's all with unpacker! There is one thing left - we need to insert packer code to packed file and set it up. I decided to automate it. To do this, let's add a new project named unpacker_converter to a solution. The purpose of this project is to open the result of unpacker compilation - the unpacker.exe file, read its only section data (actually, the code) and convert it to an .h file, which we include to simple_pe_packer project. Let's set the same include directory in unpacker_converter project as in simple_pe_packer project, in order to include PE library .h files, then add main.cpp file to project and start development. It is necessary to set Project Dependencies: unpacker on unpacker_converter (probably, this is not absolutely logical, but that's fine). After that we will build everything in both release and debug configurations. We write offsets relative to unpacker code beginning (in built binary form) of two numbers - 0x11111111 and 0x22222222. These numbers will be rewritten by unpacker, and offsets 0xC (12) and 0x13 (19) are calculated in any HEX editor or using any autogenerated unpacker.h file. They are likely remain unchanged, because we are not going to write code before two mov commands in unpacker. //Unpacker body (autogenerated) #include "unpacker.h"
That's all! Now the unpacker will be set up and added to the packed file! Let's test it. As always, we will pack ourselves, as a result we get packed_simple_pe_packer.exe file. We will run it and see long-expected window, for which we had to work so much! So, the unpacker is correctly built, set up, converted and run, which is good. At the next steps we will make it to do more sensible things!